The 73rd annual Venice International Film Festival was held from 31 August to 10 September 2016. English director Sam Mendes was the President of the Jury for the main competition. The opening night film was Damien Chazelle's musical La La Land. The Golden Lion was awarded to Lav Diaz's film The Woman Who Left. A new project named Venice Production Bridge was introduced in this edition of the festival. The new project is intended to attract industry professionals and focus on original projects for films, internet, series, virtual reality, and works in progress, in order to help their development and production. It is also meant to work in conjunction with the Venice Film Market which started in 2012. Such projects as Final Cut in Venice, meant to help finance original films from African countries, and the Venice Gap-Financing Market will come under its scope. Highlighted title indicates Golden Lion winner. - * indicates film eligible for the Queer Lion. Highlighted titles indicate Horizons Prize for Best Feature Film and Best Short Film winners respectively. * indicates film eligible for the Queer Lion. Highlighted titles indicate the Best Restored Film and Best Documentary on Cinema official awards respectively. The following films were selected for the Biennale College - Cinema section. BNL Award: Pamilya ordinaryo by Eduardo Roy Jr.
^ "73rd Venice International Film Festival, Line-up". labiennale.org. Archived from the original on 4 October 2016. Retrieved 8 August 2016. ^ Anderson, Ariston (27 April 2016). "Sam Mendes to Head Venice Film Fest Jury". The Hollywood Reporter. Retrieved 27 April 2016. ^ Roxborough, Scott (17 June 2016). "Damien Chazelle's 'La La Land' To Open Venice Film Festival". The Hollywood Reporter. Retrieved 17 June 2016. ^ "Venice film festival: Philippines drama wins top prize". BBC News. 11 September 2016. Retrieved 11 September 2016. ^ "Venice Production Bridge". labiennale.org. Archived from the original on 30 September 2016. Retrieved 18 April 2018. ^ "International Juries of the 73rd Venice Film Festival". labiennale.org. Archived from the original on 15 October 2016. Retrieved 14 April 2018. ^ "Venezia 73". labiennale.org. Archived from the original on 6 October 2016. Retrieved 14 April 2018. ^ a b Hindustan Times (25 June 2016). "Venice film fest to open with La La Land". Daily Sun. Retrieved 25 June 2016. ^ a b "Venice Film Festival 2016". Deadline. 28 July 2016. Retrieved 28 July 2016. ^ "Out of Competition". labiennale.org. Archived from the original on 4 October 2016. Retrieved 14 April 2018. ^ "Orizzonti". labiennale.org. Archived from the original on 4 October 2016. ^ "Venice Classics". labiennale.org. Archived from the original on 2 October 2016. Retrieved 16 April 2018. ^ "Biennale College - Cinema". labiennale.org. Archived from the original on 4 October 2016. Retrieved 8 August 2016. ^ "Final Cut in Venice". labiennale.org. Archived from the original on 13 October 2016. Retrieved 16 April 2018. ^ "Il Cinema nel Giardino". labiennale.org. Archived from the original on 4 October 2016. Retrieved 16 April 2018. ^ "Si e cercato Robinù". michelesantoro.it (in Italian). Retrieved 16 April 2018. ^ "Special screenings". labiennale.org. Archived from the original on 25 September 2016. Retrieved 16 April 2018. ^ "31st International Film Critics' Week". sicvenezia.it. Retrieved 16 April 2018. 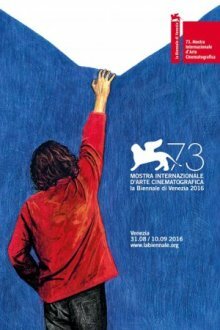 ^ "La Biennale di Venizia - International Critics Week". Archived from the original on 16 August 2016. Retrieved 16 April 2018. ^ "Venice Days, 13th edition, Films". venice-days.com. Retrieved 17 April 2018. ^ Anderson, Ariston (26 July 2016). "Venice Days Unveils Global Lineup". The Hollywood Reporter. Retrieved 27 July 2016. ^ "Official Awards of the 73rd Venice Film Festival". labiennale.org. Archived from the original on 8 October 2016. Retrieved 20 April 2018. ^ "Venice Film Festival: Golden Lion To 'The Woman Who Left'; Tom Ford's 'Nocturnal Animals', Emma Stone Take Major Prizes – Full List". Deadline. 11 September 2016. Retrieved 11 September 2016. ^ a b "Collateral Awards of the 73rd Venice Film Festival". labiennale.org. Archived from the original on 12 September 2016. Retrieved 7 May 2018. ^ "Full list of prizes awarded to Venice Days films". venice-days.com. Retrieved 9 May 2018. ^ "FIPRESCI - Venice Awards 2016". fipresci.org. Retrieved 5 May 2018. ^ "Ecco i premiati Kineo 2016!". kineo.info (in Italian). Archived from the original on 11 September 2016. ^ "Starlight Cinema Award, tutti i premiati". Retrieved 9 September 2016. Wikimedia Commons has media related to 73rd Venice International Film Festival.